Washingtonpost.Newsweek Interactive has unveiled a completely new, redesigned Newsweek website that is chuck full of ad-supported video programming and rich media experiences, all powered by Brightcove. 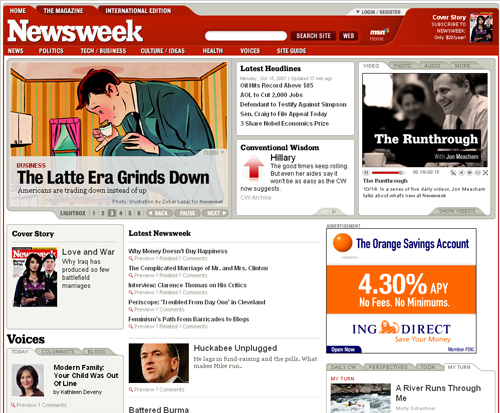 The new site, which has migrated from MSNBC.com to a standalone Newsweek.com website, features a number of video players of different sizes, with email and "get link" distribution options, and a full-screen feature (designed and fully customized using Brightcove's developer APIs). The new site also includes homepage promotions, photo flips and interactive maps, which were created using Brightcove Storymaker - a rich media publishing product that enables non-technical producers create, update and maintain Flash media experiences and editorial content without having to know any scripting language or Flash programming. We are thrilled about the launch and excited to be chosen as the Internet TV platform for such as popular and well-respected news magazine. Other WPNI properties using Brightcove include The Washington Post and Slate V.